Bosser, J. (1984) Bull. Mus. Natn. Hist. Nat., Paris, section B, Adansonia 3: 247. Type: ?. Sarcocephalus cadamba (Roxb.) Kurz, Forest Flora of British Burma 2: 63(1877), Type: ?. 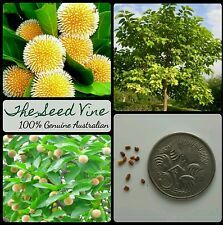 Nauclea cadamba Roxb., Flora Indica 1 (2): 121(1824), Type: Rheede, Hort. Ind. Malabar. tab. 33 Katou-tsjaka (1678-1703). Anthocephalus chinensis (Lam.) A.Rich. ex Walp., Repert. 2: 491(1843), Type: Previously misapplied name. Anthocephalus morindaefolius Korth., Verh. nat. gesch. Ned. Bezitt. Bot. t. 48: 154(1842), Type: Korthals s.n., Melintang, Sumatra (L). 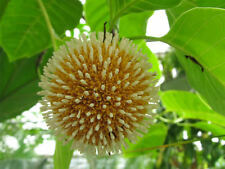 Cephalanthus chinensis Lam., Encycl. Meth. 1: 678(1785), Type: Lectotype: Sonnerat s. n. Asia?. Blaze finely layered and dead bark layered. Blaze darkens on exposure. Stipules tapering to a point at the apex. Cream or pale brown glands resembling insect eggs normally present on the inner surface at the base of each stipule. Leaf blades about 13-36 x 8-18 cm. Flowers in spherical heads, about 2.5-4 cm diam. Calyx about 5-8 mm long. Corolla tube about 8 mm long, lobes about 2-3 mm long. Ovary 2-locular in the basal part, but 4-locular in the upper part. Styles and stigmas cream. Fruit multiple, fused into a head about 2-4.5 cm diam. Seeds very small, about 1 mm long, cylindrical, testa thin and rugose. Cotyledons broadly elliptic to +/- orbicular, about 3 mm long. At the tenth leaf stage: leaf upper surface and petiole clothed in very short hairs; stipules interpetiolar, apex acuminate with short, inconspicuous hairs along the margin. Occurs in CYP and NEQ. Altitudinal range from near sea level to 250 m. Grows in dry rain forest and gallery forest. Also occurs in Asia and Malesia. 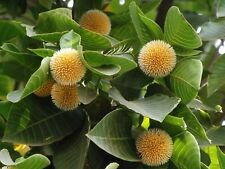 Under good conditions, this species grows to a large tree and has been cultivated in SE Asia as a timber tree. Leaf material of this species was active against some tumors. Collins et al. (1990). Buy It Now for only: US 632,94 руб. Neolamarckia cadamba Бор цветок дерево экзотические семена!